TubePlayer is a lightweight stand-alone player for YouTube. 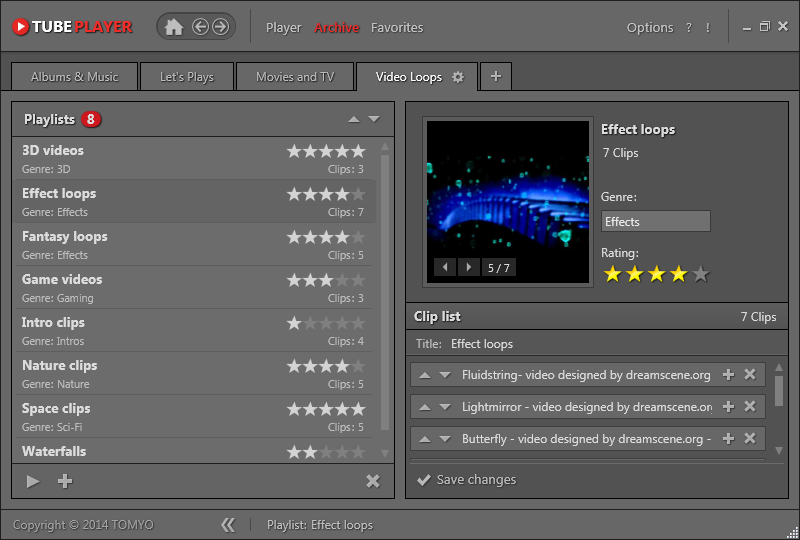 With TubePlayer it is easy to create, save and manage YouTube playlists on your desktop. No YouTube account needed! All playlists are saved as seperate files, so it’s easy to copy playlists on a portable device or to share playlists with your friends. Sort your Let's Plays, create playlists with the latest comedy clips, listen to audiobooks, or make a music list for your next party! TubePlayer uses the YouTube API for Developers. 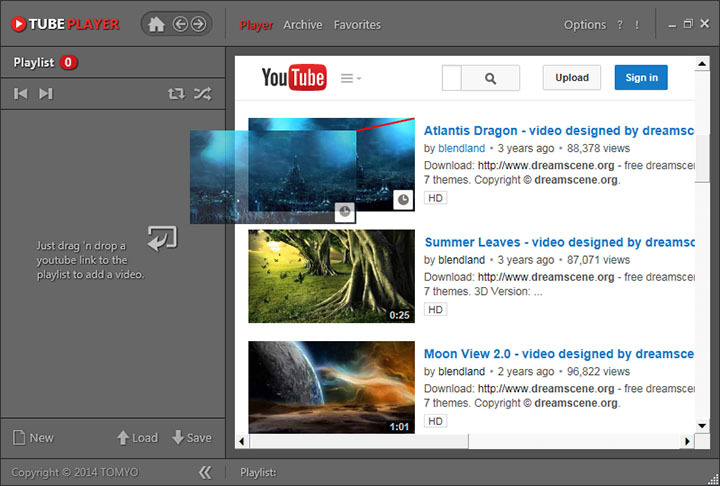 - Play your youtube clips in a free resizable player window! - Drag 'n drop a video link from the browser window to the playlist. - Manage all your playlists directly in TubePlayer. Read the complete manual for more details. 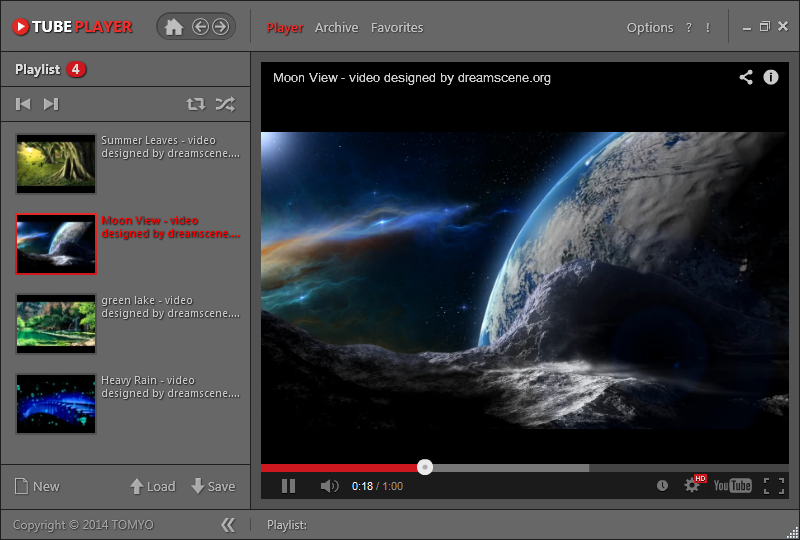 Download the current version of TubePlayer (freeware). Available as complete version (with installation), or as zipped version (without installer, e.g. for portable usage). Show version history. The Setup automatically associates the "TubePlayer playlist" file type (*.tppl) with your installed version of TubePlayer. You can manually associate the file type by right clicking on a playlist file (*.tppl), click "open with" in the context menu, and select TubePlayer.exe as default program. Turkish translation for TubePlayer (friendly translated by Alp Arıbal). Download (right-click, save as): Translation_tr-TR.xml. Spanish translation for TubePlayer (friendly translated by G. González). Download (right-click, save as): Translation_es-ES.xml. Russian translation for TubePlayer (friendly translated by Pavel K.). Download (right-click, save as): Translation_ru-RU.xml. Hungarian translation for TubePlayer (friendly translated by videotanfolyam.hu). Download (right-click, save as): Translation_hu-HU.xml. Dutch translation for TubePlayer (friendly translated by Robin L). Download (right-click, save as): Translation_nl-NL.xml. French translation for TubePlayer (friendly translated by Tony B.). Download (right-click, save as): Translation_fr-FR.xml. NEW !!! Polish translation for TubePlayer (friendly translated by olj001). Download (right-click, save as): Translation_pl-PL.xml. Just copy the translation file (*.xml) to the 'Languages' folder included in the installation directory of TubePlayer. The Microsoft .NET 4 Framework (or any higher version) must be installed to use TubePlayer. Not needed for Windows 8 and newer, the NET Framework is already included. To watch YouTube Clips in TubePlayer, a internet connection is needed. We recommend a flatrate DSL connection with at least 1000 kbit/s download bandwith for video streaming. Your professinal shutdown timer for all tasks! Create your own ringtones and message sounds for free! Transform your pictures into miniature style photos! TOMYO.org is a community of free and independent software developers with a focus on free software for Microsoft Windows.